With the completion of the final batch of Ivatt's N1 0-6-2T suburban tank, the Great Northern Railway (GNR) did not require any further suburban tank locomotives until after World War 1. In 1919 Gresley considered a number of possible designs for a new suburban tank engine, including an improved 0-6-2T, a 2-6-2T, and a 2-6-4T. The improved 0-6-2T was accepted for development, although it is interesting to note that Gresley would later design a 2-6-2T (V1) and his successor, Thompson, would design a 2-6-4T (L1) both for heavier suburban and branch work. The new design was based on the N1, but featured larger diameter cylinders, piston valves, a superheated boiler, and a greater water capacity. The piston valves were positioned above the cylinders, requiring a high-pitched boiler. This combined with a short chimney to keep the locomotive with the Metropolitan loading gauge, gave the N2s a powerful appearance. Sixty locomotives were built between 1920 and 1921, and these were followed by forty-seven Group Standard N2s between 1925 and 1929. Although initially built for suburban services in the Kings Cross area, later locomotives were built for similar services around Edinburgh, Glasgow and Dundee. There were four main variants of N2, although the sub-classifications (N2/1, N2/2, etc) were not used until about 1928. N2/1 was used to describe the first batch built between 1920 and 1921. These were built at Doncaster (Nos. 4606-15) and the North British Locomotive Co. (Nos. 4721-70). The N2/1s were built with condensers, right-hand drive, a short chimney, and small (7.5in diameter) axlebox journals. Problems with the condensers were soon experienced. Water would surge from the tanks through the pipes to the blastpipe and into the cylinders causing broken piston rings and bent cotters. The condensing drain pipe was widened, but this did not solve the problem. Baffle plates were fitted to the tanks from 1926 to stop the water surging forward, but this appears to have been only a partial solution. A number of N2/1s were moved to Scotland in 1927-28, and had their condensers removed at Doncaster or Cowlairs. Some of these returned to the London area in 1931, and the condensers were refitted. As with the N1, a water tank was located under the N2/1's coal bunker. This was shaped to also surround the coal space, and had a sloped top to ease coal shovelling. Unlike the N1, the bunker was only flared at the back. Originally lubrication of the axleboxes was from a siphon trimming feed. After an experiment in 1922 with No. 1736, Wakefield No. 7 mechanical lubricators were found to consume less oil and give less trouble. These lubricators became standard from 1926. A Wakefield No. 7 lubricator was also provided for cylinder and steam chest lubrication. The N2/2 batch was built in 1925 by Beyer, Peacock, & Co. and were numbered 2583-94. These were the first LNER Group Standard N2s, and featured left-hand drive and a tall chimney, but no condensers. The original intention was for twelve C16 4-4-2Ts for Scotland, but the order was changed before being placed. Hulburd No. 6 mechanical lubricators were fitted for the axleboxes, and a Detroit sight feed lubricator was positioned in the cab for the cylinders and steam chest. In 1932 they had GE-style (Great Eastern) condensing gear and short chimneys fitted, when they moved from Scotland to the London area. The N2/2s were quickly followed by the first batch of N2/3 locomotives. These were built at Doncaster in 1925 and were numbered 892-7. These were similar to the N2/2s, but featured improved axleboxes with large (8.25in diameter) journals. The axlebox springs were mounted with cast steel hangers. The Running Department reported that the new spring arrangement resulted in much steadier running, but Gresley rejected the recommendation to fit it to the existing N2/1 and N2/2 locomotives due to cost. The axleboxes were lubricated with a Wakefield No. 7 mechanical lubricator, whilst a Wakefield Eureka D sight feed lubricator was placed in the cab for cylinder and steam chest lubrication. Condensing gear was never fitted to any of this first batch of N2/3 locomotives. The N2/4 locomotives were built in two batches in 1928 and 1929, by Hawthorn, Leslie & Co. (Nos. 2662-81) and the Yorkshire Engine Co. (Nos. 2682-4). The N2s fitted with condensing gear were still experiencing water surge problems, so in 1927 it was decided to try the GE-type of condensing gear as used on the N7s. Construction had already started on the first ten Hawthorn locomotives, so these were modified by Doncaster as soon as they were delivered. Later engines were built with the GE arrangement. The main feature of this new arrangement was the lack of a U-bend. This did not solve the problem, and extra baffle plates were fitted from February 1929. This also did not cure the problem, and a number of pipe modifications were tried. The cure appears to have been to drill some holes in the vertical pipe in the tank, so that the only water forced out of the tank was a small quantity through the air vent behind the cab. The air vent was then bent over to direct the water onto the coal in the bunker. From December 1929, all N2s with the GE arrangement were modified. The N2/4s also had a deeper ashpan, enabling a damper door at the back end of the ashpan. Most of the earlier N2s would eventually be fitted with this feature. 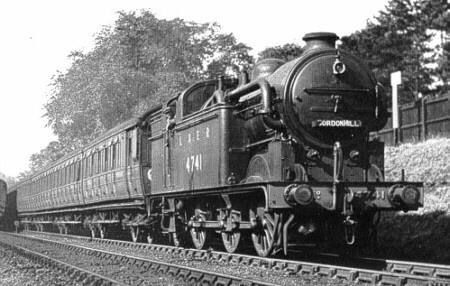 The N2/4s were also fitted with Wakefield No. 7 mechanical lubricators for both axlebox lubrication, and cylinder/steam-chest lubrication. Dry sanders were fitted, unlike the steam sanders fitted to earlier N2s. A second batch of N2/3 locomotives were built between 1928 and 1929 by the Yorkshire Engine Co, and numbered Nos. 2685-90. These were actually the same as the N2/4s except ceondensing gear was not fitted. It was decided to class them as N2/3s instead of introducing a new sub-classification. Originally allocated to Scotland, four moved to the GN Section in 1931-32 and had GE-style condensing gear and short chimneys fitted. Although these four locomotives were identical to the N2/4s, they were not re-classified until 1939. The N2s boilers were very similar to those used on the N1 class, except they were fitted with a twin tube superheater. In 1944, the Southern Area fitted an 18-element Robinson superheater to No. 4756. This proved satisfactory, and the Southern Area converted all of their N2s between 1944 and 1950. The Scottish Area changed superheaters according to boiler availability, and only eight received 18-element superheaters. Both the Schmidt and Robinson 18-element types were fitted, and two switched back to the original twin tube type. The first N2s were put to work on the Kings Cross Metropolitan workings, displacing the remaining C12 4-4-2Ts and most of the N1s. The N2s were an immediate success. Rapid housing developments in the North London area led to Kings Cross having forty N2s on its roster by 1925. As well as suburban services, the Kings Cross N2s also hauled most of the empty coach workings for the main line expresses. After trials in 1924 in the Glasgow area, twelve new N2s were ordered for the Scottish Area. These were initially allocated to Dundee, St. Margaret's, and Eastfield. As well as the intended heavy suburban traffic, the St. Margaret's N2s would often find themselves on transfer goods workings. Construction of standard N7s in 1927 displaced many of the Kings Cross N2s to Scotland. Dunfermline, Haymarket, and North Berwick all acquired N2s for the first time. The Scottish N2s performed their duties well, but they were never very popular and acquired nicknames such as "Metropolitans" or "Bulldogs". The fitters found them troublesome, and the engine crews found them crude and uncomfortable. In 1928 they were also discovered to displace the track in the North Berwick area, and a speed limit of 40mph was applied to this line. This was followed by a derailment of No. 2690 near Gartmore in October 1929, whilst hauling an Aberfoyle train. This was quickly followed by the N2s being banned from a number of Scottish branch lines. As the V1s became available, twenty-eight N2s were permanently moved back to London. The remaining Scottish N2s spent much of their remaining lives idle or operating as pilots. Two N2s were tried in West Riding in 1926. This trial was followed by a permanent allocation to Bradford and Ardsley in 1931. The West Riding N2s were found to have much quicker acceleration than the N1s, but their high-pitched boilers made them top-heavy. This was accentuated by the many sharp curves in the area. From September 1937 to August 1939, the high-speed streamlined "West Riding Limited" was hauled between Bradford Exchange and Leeds Central stations by a pair of N2s. The main leg between Leeds and Kings Cross was hauled by an A4 Pacific. By 1945, all of the West Riding N2s had returned to London or moved to Nottingham. N2s were rarely seen in the North East (NE) area. Between 1931 and 1932, Newcastle had three of the ex-Scottish N2s. These spent some of their time at Gateshead hauling the Sunderland to Blackhill services, but proved to have inadequate water capacity for the 47 mile run. All three had been transferred back to Scotland by June 1933. All 107 N2s survived into British Railways ownership. At Nationalisation (1948), the allocation was Kings Cross (57), Hornsey (10), Hatfield (14), Hitchin (2), Colwick (5), Neasden (3), Parkhead (8), and Kipps (8). N2s would continue to work their originally intended duties at Kings Cross until the arrival of the diesels in the mid/late 1950s. The first withdrawal was in 1955, but a full withdrawal programme did not start until 1957. Many of their later duties included standing-in for diesel failures and acting as station pilots. The last thirteen N2s were withdrawn in 1962. One of these last thirteen, No. 69523 (LNER No. 4744) was purchased by the Gresley Society. The following details are for the N2/1 and N2/2 sub-divisions operating with the original twin-tube superheaters. The 18-element superheaters had larger tube areas (562 sq.ft.) but smaller flue (257 sq.ft.) and superheater (192 sq.ft.) areas, resulting in a total heating surface of 1129 sq.ft. N2/3 and N2/4 locomotives were slightly heavier at 70 tons 8cwt and 71 tons 9cwt respectively. Heating Surface: Total: 1205 sq.ft. One N2 survives into preservation. LNER No. 4744 (BR No. 69523) was built in the 1920-21 batch for the GNR. Now owned by the Gresley Society, No. 4744 can be found on the Great Central Railway. No. 4744 is also a film star, having played the part of The Scotch Flyer in the film The Railway Children. Langley sell an N Gauge whitemetal kit of the N2, which fits the Graham Farish Prairie Chassis. The 3mm Society produce a kit of the N2 for 3mm scale. Hornby sell a ready-to-run OO gauge (4mm scale) model of the N2. Nu-Cast also sells a whitemetal 4mm scale kit of the N2. Warren Shephard sell a 7mm (O Gauge) kit of the N2. The kit includes brass etchings and castings, but requires wheels and a motor. Thank you to the P.H. Groom collection for permission to use the above photograph of N2/2 BR No. 69505 at Grantham. Thank you to Malcolm Peirson for the photograph of No. 4741 with condensing gear.